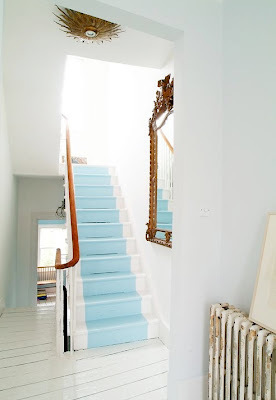 Stairs are an easy thing to forget when decorating your house...but just look at all the ways you can add a little funk into your commute upstairs or downstairs. i wouldn't mind walking up any of those stairs. how fun! How much fun! 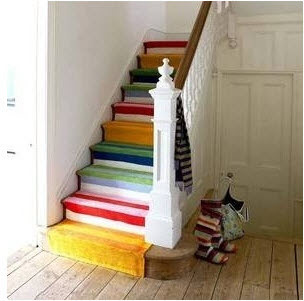 I love all the painted stairs. I love those funky pink stairs! The more fun, the better! 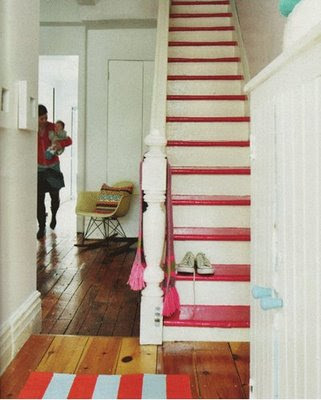 I want to own a house with a staircase so I can paint them flamingo pink! I love the turquoise one! The first pic is also amazing!! I love this post!!! The second to last photo shows a space that is so simple but wonderful...the painted turquoise runner with that ceiling fixture, oh I want to get my hands on that! And the worn radiator and mirror reflecting the stair treads...I'm in love. I like them all...I can't decide which one the best! What fun. 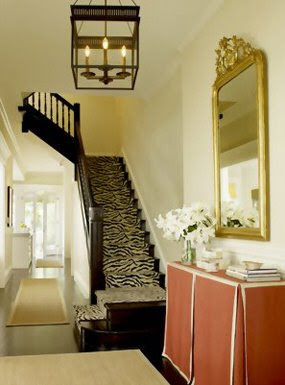 Love the painted stairs that look like a runner up the stair. First image in orange is great. fun! i love the blue and white! 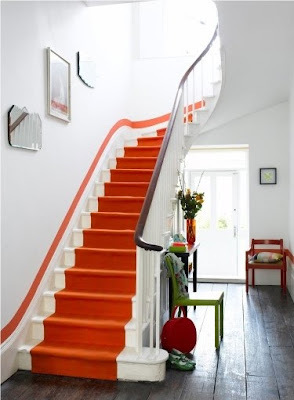 Loving the orange stairs! Our new home has stairs that look a lot like many of the photos. Now if I could just convince my hubby that we need to rip up all the new wall to wall carpet that came with the house and put in hardwood. One day! Love this. 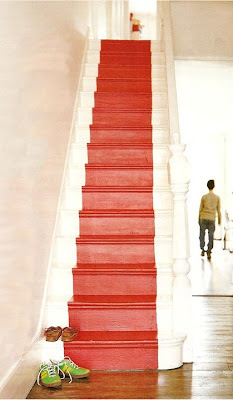 I was just thinking that I have to do away with the stair carpet and do something fun in it's place. Great ideas. But here's my question- how do i deal with the nasty, dirty, brown, industrial carpet that's currently in my client's landings and hallways and stars??? underneath is wood, nails and possibly the gateway to hell. awesomeness! love number 1!! i want stairs someday. and when that day comes i want a runner. paint, rug..i don't care. something. wow i love those orange stairs!! and the blue on the white..gorgeous.